Our third day in Antigua was definitely our most active day yet, as we set out to hike Pacaya Volcano, situated near Guatemala City. Before giving ourselves too much credit, we were told that the hike is very exhausting due to its elevation and high altitude so it was recommended that we horseback ride up the volcano and then hike down. When we arrived to the volcano, there were horses ready for anyone wanting to ride them, so we hopped on and began our trek up the volcano. Since the volcano is still active, it is forbidden to hike past a certain area, just in case the volcano should erupt at any given moment. A few weeks before our arrival, the volcano had a small eruption, so some of the ground we stopped at was still hot. Thanks to our tour guide who provided us with marshmallows, graham crackers, and chocolate, we were able to make s’mores over the hot ground. The views from the highest part of the volcano we were able to access, as well as throughout the trek down the mountain were beautiful, to say the least. We were grateful to have such great weather during our hike, but we were even more grateful once we had lunch and dinner after what was indeed an exhausting but worthwhile hike! Beauty can be found in the most unexpected places. To pick up from my last blog post, after lunch, we continued to walk around Antigua to see some of the more well known sites. We happened to have eaten lunch right next to the Arco de Santa Catalina, which was built in the 17th century as a passageway for the Santa Catalina covenant and an adjoining school. Its purpose was for the nuns to pass from from one building to the next without having to go out into the street. This arch is the only remnant of the covenant, and is considered by many to be a “must-see” in Antigua. From there, we continued to walk along the street and pass through a local market shop with traditional trinkets and goods. We then came across Convento Santa Clara which like so many other buildings had been destroyed by various earthquakes since the 1700s. Following our time at Convento Santa Clara, we found La Merced Cathedral which was built in 1548 and rebuilt in the 1700s since it had been destroyed twice by earthquakes. The Cathedral was beautiful and had a stunning view outside of both the scenery and of locals picnicking and enjoying the sunset. We made our way back to the hotel (and passed the Arco de Santa Catalina once more) to get cleaned up before going out for dinner. We had to get a good night sleep though because we had a big day ahead of us the following morning. 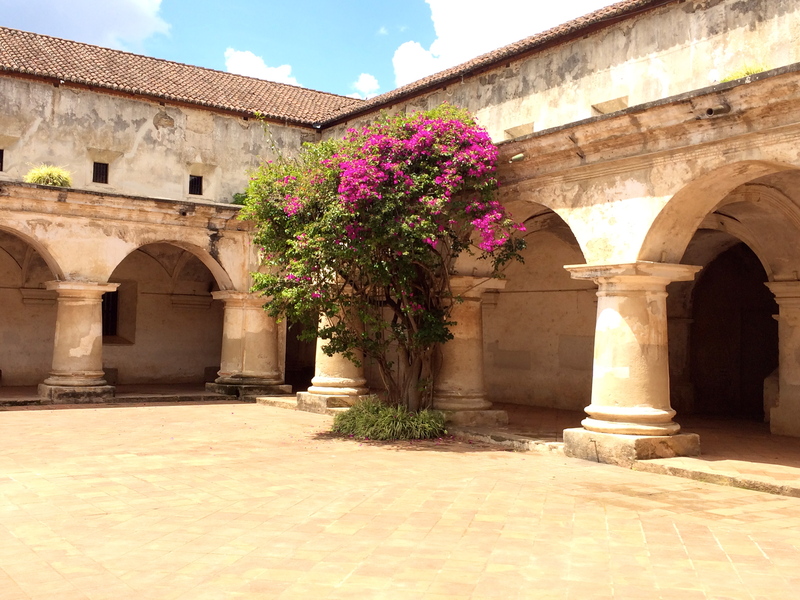 Our first morning in Antigua was spent at El Convento de las Capuchinas, the largest covenant in Antigua built solely by Capuchin nuns in the 1700’s. Unfortunately, after some destruction caused by an earthquake, the covenant was abandoned, but restored in the mid-1900’s for the pubic to see. From there, we walked over to the Catedral de Santiago, which has ruins dating back to the 1500’s. Although the cathedral was destroyed twice by two different earthquakes, the ruins were still beautiful and it was a great sight to see with an abundance of history behind it. Following our morning excursions, we took some time to walk around the city and explore a local market. While doing so, we came across a nice, small restaurant to have lunch at before beginning our afternoon explorations which will be continued in an upcoming post. Last summer I participated in a medical mission trip to Guatemala, and after the trip, my father, brother, and I spent a few extra days in Antigua, Guatemala. Over the next few days I’ll be posting about my travels in Antigua because it’s better to post this late than never, right? After the medical mission ended, we arrived at our hotel and had a light lunch before resting for a few hours. I ordered a black bean soup with a corn tamale on the side, and it was delicious; just what I needed to help me take a nap. When we woke up, we walked around the city and came across two individuals pushing their small vehicle onto its side to fill it up with gas. We also walked past a building designated for Alcoholic’s Anonymous meetings before stumbling upon a lively restaurant with karaoke where we ordered chips and guacamole for the table, and chicken quesadillas for me. After dinner, we walked back to the hotel to get a good night sleep before waking up early the following morning to further explore the city.